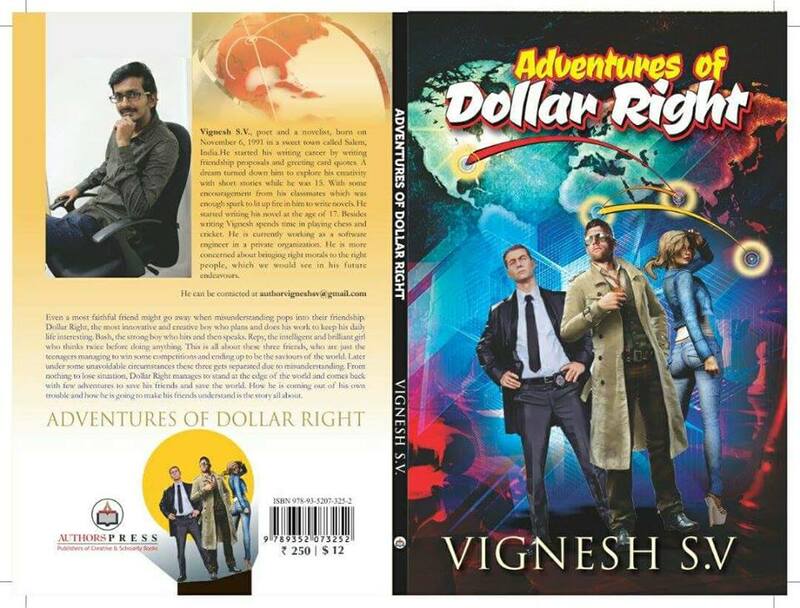 Software Engineer turned poet and author, Vignesh SV had first released Adventure of Dollar Right as an eBook in 2013. I did not get to read the book at that time, but I learnt from one of my friends that it was a really good read except for the minor grammatical errors. So, when the hard copy of the book was released in May this year, I naturally developed an interest to read it. Thanks to Mr. Vignesh for sending me the book for an unbiased review. The first that appealed to me was the thoughtful and colorful cover page, which somehow assured me that I was in for a treat. Thankfully I was proven right as the book tells an engaging tale of friendship and the struggles and togetherness that form its integral part. Dollar Right, Bash and Repy are three teenage friends who win various competitions and unintentionally become the heroes of the world. While Dollar is the most innovative and creative of the three, who plans every task, Bash is more aggressive and prefers to hit before talking. Repy, the only girl in the group is extremely intelligent and brilliant and thinks about everything thoroughly. The happy friendship of the trio hits rough weather when they get separated due to some misunderstanding. It is then that Dollar Right takes works hard to turn the situation into an adventure and save both his friends and the world. The first thing I would like to say about the book is that it was extremely well drafted. The overall concept of the book was also really interesting and I truly loved the manner in which Vignesh has depicted the ups and downs in the relationship of the three friends. The adventure has been beautifully woven into the story and the ending left me amazed. Overall, I found the Adventure of Dollar Right a great addition to my bookshelf and I wish Vignesh great success with this book and his future writings.